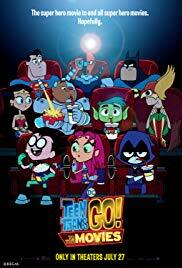 Robin, Beast Boy, Cyborg, Raven, and Starfire are collectively the Teen Titans. They belong to the superhero universe, but they’re more sidekicks than heroes – something that the superheroes often rub in. 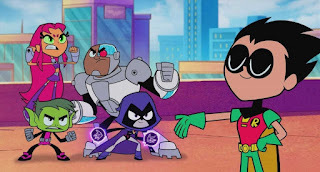 The Teen Titans confront a villain, but become distracted in explaining their identities, allowing the villain to escape. The Teen Titans want to legitimize their status as superheroes, and decide that they need to have a movie made about them; in order to do this, they are willing to travel through time to ensure that no other superheroes exist – when this doesn’t work out, they decide instead that they need to have an arch-nemesis. Thankfully (?) one arises in Slade. The Titans must work to stop Slade’s intention of brainwashing the world. There is no real adoption connection in the plot of the story; however, there are some scenes that could surprise viewers. Most notably, Batman’s origins are briefly shown. Batman became a hero due to his parents being murdered in a dark alley. 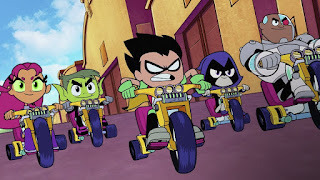 In an attempt to stop Batman from becoming a superhero, the Teen Titans travel back in time and direct Batman’s parents away from that alley; they live, but Bruce Wayne never becomes Batman. When the Titans realize that this has caused the present-day world to be overrun by villains, they travel back in time again, and this time, shove Batman’s parents off-camera into a dark alley, where we hear the gunshots that kill them. The Teen Titans also cause another aquatic superhero to die, but later go back again and correct it. In a scene that seems very disjointed from the rest of the film, at the very end of the movie, Robin pops on screen and says, “Kids, ask your parents where babies come from.” And then the credits roll. The time-travel scenes could lead some kids to think about how their lives would have been different had the tragedies that shaped their life – and perhaps necessitated their adoptions – been avoided. When Robin is discouraged, his friends try to cheer him up by helping him see that he truly is a hero. The film does capture the value of friends. In addition to the more significant challenges which are covered in the “adoption connection” section, the film has a lot of toilet humor. Batman’s parents being forcibly shoved into the alley where they are murdered is probably the most concerning scene; Robin’s film-ending quip, “Kids, ask your parents where babies come from” could also be somewhat bracing or complicated for some adoptive families if they are unprepared. It’s an important discussion to have, but it’s one that requires some thought, and Robin’s hurried play-it-for-a-laugh comment isn’t probably the right bridge into this conversation. 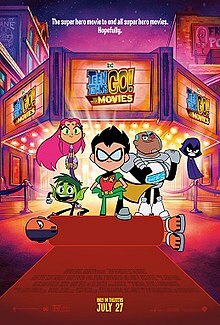 Teen Titans Go To The Movies was silly, and funny at points, but seems to be geared towards a fairly young demographic. Lots of kids in the theater laughed during toilet jokes, including one scene that had also been featured in the trailer which centered around a very lengthy bout of flatulent sounds. I think it is the youth of the demographic that concerns me for audiences touched by adoption or parental loss, mostly because of the scene involving Batman’s parents. The Teen Titans are almost cavalier in shoving Batman’s parents to their death, and although in the context of the movie they’re setting the world right, it could be surprising and painful for kids who have lost – or who have fears of losing – their parents. The fact that gunshots are heard signifying their murder could also be hard for some young viewers, especially those who have experienced violence. It’s possible that these scenes won’t be triggering to your kids, but I feel they’re risky. Because of them, at least for families touched by adoption, foster care, or trauma, it feels like a safer bet to leave this one to kids 13 and up. What changes in his thinking did Robin need to make in order to become content? Given a choice, do you think Superman and Batman would choose to erase the traumas that they experienced? Who was your favorite of the Teen Titans?